Rescue 2 with the hood up at Station 7. Photo by Daniel Hirsch. The sun is way past its apex, so that means it’s time for… The Afternoon Report! At San Francisco Fire Department Station 7 on 19th Street, the afternoon brought some unexpected car trouble to Lieutenant Randy Hiro. But not just any car, the fire department’s imposing Rescue 2 was leaking fluids. 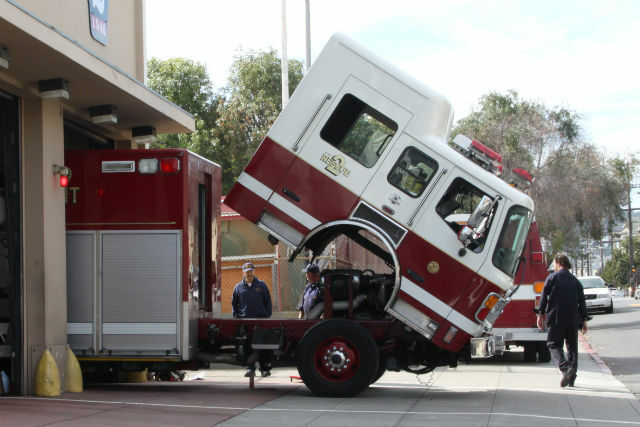 A mechanic lay on his back on the sidewalk to investigate as the truck’s massive hood was propped up at a precarious angle. Over twenty feet long and weighing in at 24,000 pounds, Rescue 2 is one of two heavy rescue vehicles in the Fire Department’s fleet. It’s packed to the gills for almost every kind of situation wherein someone needs rescuing from terrible calamity. “Hazmat suits, scuba diving gear, auto-extraction equipment,” said Lieutenant Hiro. He then listed situations requiring the specialty gear stored in Rescue 2: building collapses, entering confined spaces, low angle rescues, high angle rescues, and more. A diesel powered vehicle, Rescue 2 has routine maintenance schedule and is regularly serviced, “but sometimes things just happen,” said Hiro of the leaks spotted under Rescue 2. Hiro explained that the mechanic was assessing the damage and whether or not the vehicle had to be taken to central station for more serious maintenance. “It’s not like the check engine light, where you can just cover it up with a crucifix,” joked another firefighter standing by Hiro. I asked Hiro what happens if Rescue 2 goes into the shop and there’s need for a scuba rescue or someone needs to get pulled from a car with the auto-extraction equipment (aka the Jaws of Life). He said not to worry, they put all the gear they need in a relief vehicle. Paul Long displays the patches of DIY.org. Photo by Daniel Hirsch. On 20th and Shotwell, Paul Long was doing another kind of tinkering under the hood. 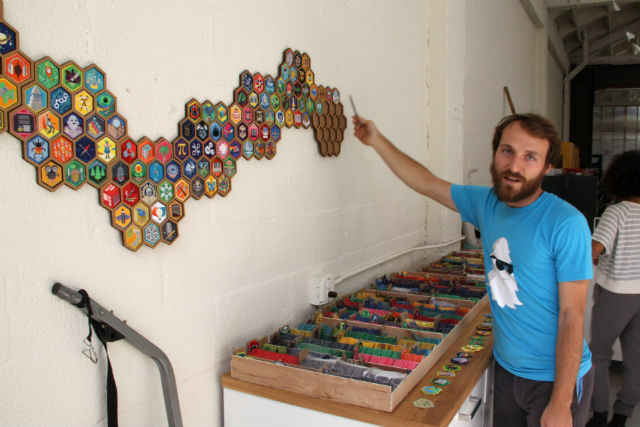 As one of the people behind DIY.org, a Mission District-based website that encourages kids to develop new and crafty skills, he was getting his hands dirty preparing for the site’s first ever retail space and workshop. “Today, I’m going to make planters,” said Long as he stood beside a stack of soil bags. Like a fair number of DIY-type projects, Long said the build out of their retail space has taken longer than expected. They moved from their small offices in June and hope to be fully open by mid November. It’s taken awhile, in part, because they plan for the large warehouse space to include lots of different elements, says Long. The front area will be a retail space for DIY gear, it will also have a hands-on workshop space for kids, and a tool lending library. In the back are DIY.org’s offices, an animation studio, and storage. In addition to setting up planters, the other activity of Long’s day was sorting badges. On its website, DIY.org has 120 challenges, for each activity completed the kids who are DIY member get a patch. Patchworthy challenges include activities such as weaving, wilderness skills, graphic design, web design, urban design, sculpting, game developing, and many more. Long was kind enough to share with this journalist a really nifty patch with a typewriter on it. I wish Jeff Adachi was mayor. Yes on b in our hearts forever.